Like its littermate Dashboard, OS X’s Spotlight feature has been with us since OS X Tiger, way back in 2005. That entire time, it’s been a systemwide search feature parked at the top of the screen. But Spotlight in OS X Yosemite is different. Really different, with a new look, a new location, and a new set of data sources. This is not the Spotlight we’ve come to know. Spotlight in Yosemite has moved from the top right of the screen to somewhere in the middle. In Yosemite, Spotlight has a new location. While the Spotlight menubar item remains anchored near the upper-right corner of the screen, next to the Notification Center icon, the Spotlight window itself is no longer stuck up there too. Instead, when you hit Command-Space, Yosemite’s Spotlight bar appears in the middle of your screen—well, the upper middle, to be more accurate. The box—and the type inside it—is also much larger than in previous versions of Spotlight. 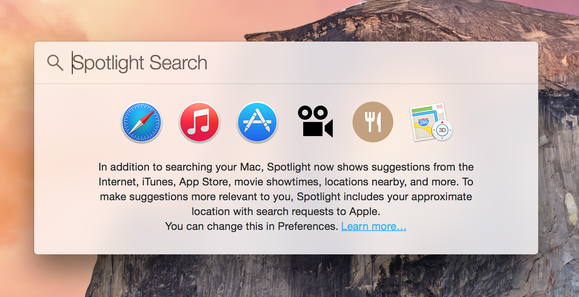 In Yosemite, Spotlight’s search results come in two flavors: immediate and detailed. As you begin to type, the text will immediately be auto-filled with what Spotlight thinks is the most likely match for the thing you’re looking for. This is ideal for using Spotlight to launch apps. As you begin typing the word calendar, you’ll see the word completed for you immediately in light-gray characters. Press Return, and the Calendar app will launch immediately. Give Spotlight a couple of seconds, though, and the thin Spotlight window will expand to become a window full of detailed results from numerous data sources. In Mavericks, Spotlight searches your files and the dictionary, and offers links to launch Web or Wikipedia searches. 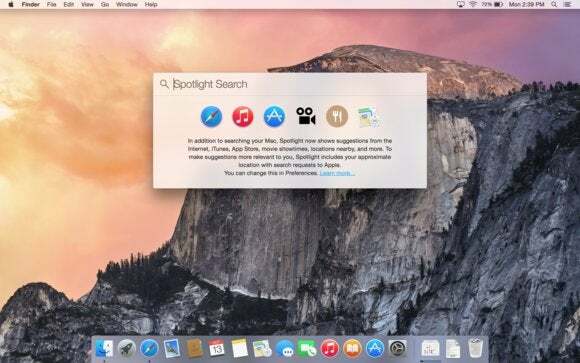 In Yosemite, Spotlight expands that roster of sources to include news headlines, maps, Bing Web search, the App Store, the iTunes Store, top websites, and movie showtimes. And these aren’t just links to open those searches in Safari: search results from those sources appear right in the Spotlight window. The new Spotlight results window is divided into two sections, below the quick text-entry area. On the left are a list of results, sorted by source. On the right is a preview pane, where you can click or use the arrow keys to select a result. In many cases the preview is all the information you’ll need; for dictionary definitions and even some Wikipedia article summaries, it does the job. But if you want more, just double-click or press Return to open the selected item in an appropriate spot. Spotlight results come from a variety of data sources now. The new features of Spotlight work quite well. Results appear quickly, and seem rich. When I entered the name of my son’s school, Maps provided its address and a thumbnail view of its location. Typing the name of a recent movie brought up its poster, Rotten Tomatoes rating, run time, trailers, plot summary, cast list, and (of course) a list of movie times. When I entered the name of a musical artist, I got a link to his iTunes artist page, one of his albums, his Wikipedia page, and his personal website. 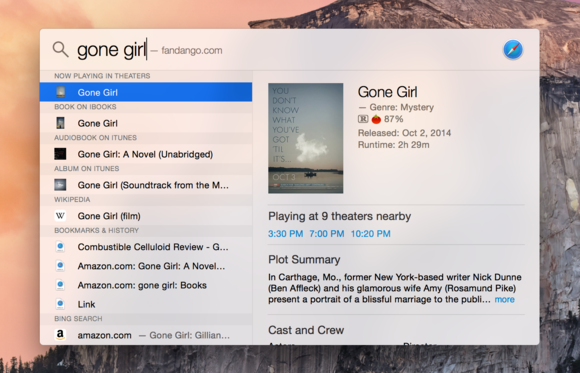 Movie information is fed right into Spotlight in Yosemite. Spotlight also now supports unit conversion, so I can impress my Canadian friends by typing 83F into the search window and telling them that yesterday’s high was 28°C. But all of those apps provide features that Spotlight doesn’t support, even in Yosemite. If I type yet in LaunchBar, it will find a document titled Yellow Elephant Test. (Spotlight will only search for the exact string yet.) If I then press tab and type BB, it will offer to open that document in BBEdit. These apps offer quick access to the history of your clipboard, support customizable hotkeys to open files, are extensible and customizable—all things that Spotlight’s fancy new search really isn’t. So in short, the new Spotlight is cool. So much so that I expect I might actually use it regularly, which I don’t really today, at least not from the menu bar. 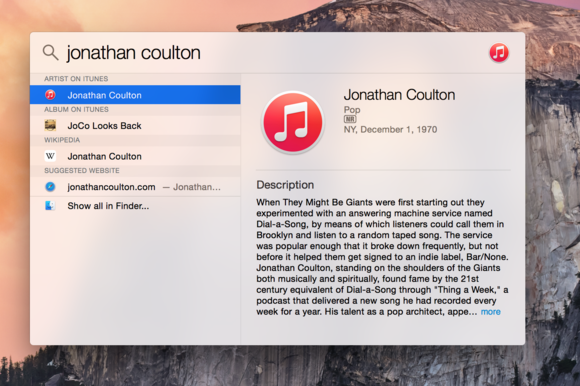 It looks great, and the responsive and rich results suggest that it will be one of Yosemite’s most popular features.